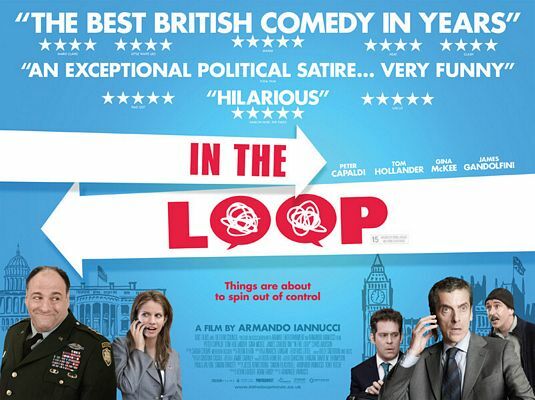 In The Loop is a satirical demolition of Whitehall and Washington: politically astute, absolutely funny and terrifyingly real. As cinematic subgenres go, political satire doesn’t generally beat blockbuster, but In The Loop not only received ecstatic critical reviews when it was released in the UK and stateside, it managed to get bums-on-seats everywhere it screened. It doesn’t matter if you’re politically in the know: most of us have met people like the bullies, opportunists and passive-aggressive backstabbers on display here. And it doesn’t matter if you’ve seen Director Armando Iannucci’s BAFTA-winning series, The Thick Of It. In In The Loop, incompetent minister Simon Foster, played by Tom Hollander (Valkyrie, Pirates of the Caribbean) is sent to Washington after making contradictory comments about possible war in the Middle East. Foster is a hapless minister whose senseless pronouncements about potential war (in the Middle East) are latched onto by vying political factions. Hollander is utterly brilliant as a man so far out of his depth he needs armbands. The set-up loosely shadows the drive for the invasion of Iraq, with various avatars for real-life politicos: James Gandolfini (The Sopranos) is a peace-pushing general reminiscent of Colin Powell; Peter Capaldi (The Thick of It, Doctor Who) is a foul-mouthed Scottish spin-doctor who bears relation to Alastair Campbell; and David Rasche (United 93, Flags of Our Fathers) hideously resembles former Secretary of Defense, Donald Rumsfeld. Okay, sure. Many people think politics are dull or that it’s transitory, so it’s considered to be the domain of TV, which can react pretty instantly to breaking news (and doesn’t cost a cinema ticket!). But Iraq is not named at any point in this film because Director Iannucci is savvy enough to understand that ambition, idiocy, and fundamentalism play a role in any conflict, in any age, in any nation. Politics isn’t transitory; it’s timeless. And so is great satire, which this is. There’s also a good deal of improvisation by the actors here, feeding the intimate documentary style and aligning it worryingly to ‘real-life.’ But, hey – if we can’t laugh at ourselves, what’s the point? Finally, it’s worthwhile to support films that are not appealing to the lowest common denominator. I highly recommend In The Loop.